Chief. (on Phone) Suzy, send in O'Hara. O'Hara. (Entering) You wanted to see me, Chief? Chief. Sit down, Mike. (O'Hara sits) I was listening to the radio on the way in. They say we've got another murder on our hands. O'Hara. Some guy, if you can believe it, named Heavensent ... Chisholm Heavensent. We found the body floating in the lagoon out by the Music Guild. Chief. No doubt stamped, "return to sender." O'Hara. Is that supposed to be funny, chief? Chief. (Apologizing for sick humor) Sorry. This job's getting to me. Another Director? O'Hara. Yeah, "King and I," I think. O'Hara. Actually, if you count the winter show, this is number three, chief. Chief. I wonder if this is what Irving Berlin meant when he said "There's no business like show business?" O'Hara. Is that another joke, Chief? Chief. What was the cause of death this time, poison, stabbing, strangulation ... gun shots? O'Hara. Yeah, all of the above. How’d you know? We found him floating face down with a half dozen shivs wounds in his back, and an extension cord wrapped around his neck. He was shot at least nine times, and the medical examiner found rat poison in his stomach. Chief. Did he have any enemies? O'Hara. Not as far as we know. Just friends. Chief. 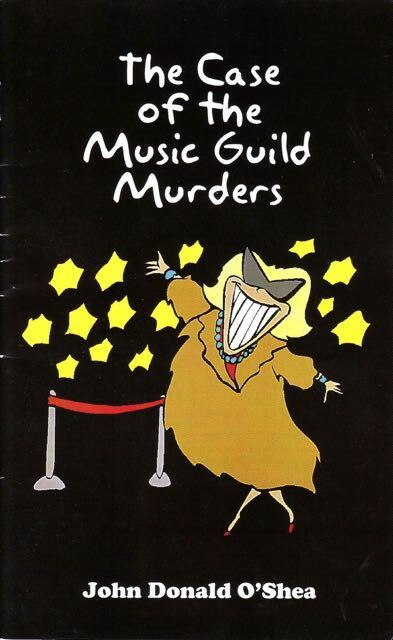 At the Music Guild that can be worse. O'Hara. Yeah, or even fatal. Chief. Any possibility this was a suicide? the Quad City Music Guild, and it was terrific..."
O'Hara. Nothing hard. But my gut tells me it was a soprano. Chief. Why not the tenor? O'Hara. If it was a tenor, we'd have found the soprano in the lagoon. No, Chief, I can feel it in my bones. It was a soprano. the victim has been shot, stabbed, strangled and poisoned. The brutality of the murder causes the police to suspect that the murderer will be found within the Guild’s stable of sopranos. Performance Time: Approximately 30 minutes, 36 pgs. This play could only have been written by an author who has directed community theater, and who has performed himself. The characters are real; the names, however, have been changed to protect the guilty. True, the author has stretched the truth a tad. But those exaggerations were in fact suggested by the real life actors, and are only the "hyperbolic extensions" of real life events. A serious and competent police officer. Humphrey Bogart or Peter Falk . dumb like a fox and very likable.